Gorgeous colors. So sophistimacated. I ❤ the back. I am never that restrained with the backing. Maybe I need to try. love, love, love, love. that sketch in lipstick is amazing. such a lucky bride – and yes, holding onto quilts for a guild meeting. GUILTY! hahaha. i adore this quilt. and yeah, what’s up with this heat… i walk outside and it’s like i’m taking a shower. grossssss. i need to start hexies or something because sitting under quilts is sucking. love this quilt! 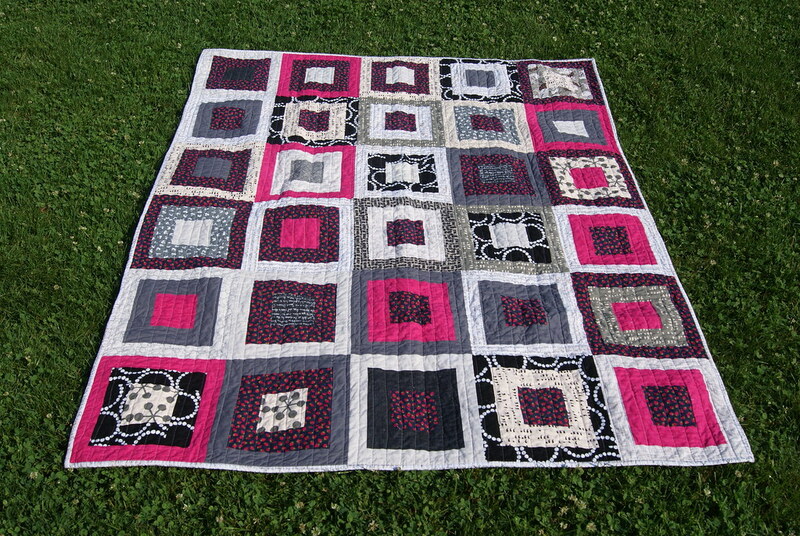 and I think the straight line quilting looks great on it! (ps- do FMQ on a baby quilt or something smaller for your first FMQ’d quilt. fighting the weight of a bigger quilt is a pain that you’ll want to work up to). and I do that with quilts and MQG meetings too! haha! you are not alone! Very pretty -makes me want to pull out my Little Black Dress fat quarters and the maroon Kona that I bought to go with it. And yes, you have to take it to the guild first. I told my husband just the other night that since he hadn’t delivered the baby quilt to his friend yet that he couldn’t take it until after my quilt meeting on Thursday:). Such a beautiful quilt! What a lucky bride. Like another commenter said, it’s very sophisticated. Great picture of it folded up on the bench! For your straight lines, did you just do organically! Two inches apart? Wow turned out really great! Love the colors. Can you please send some warm weather to us in the Netherlands? We have 55 degrees here! Your quilts looks lovely. I really like the straight line quilting! Laura I really love this quilt! 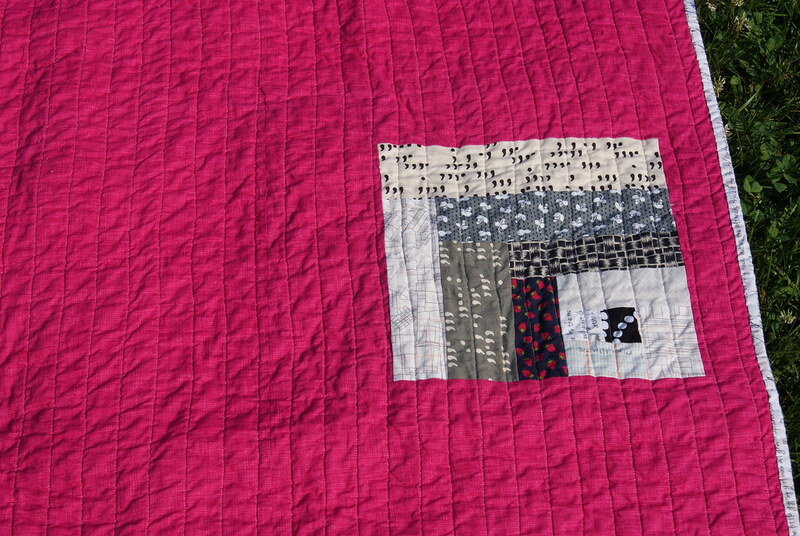 The colors a lovely (I love pink in any shade) and straight line quilting really complements the design. Lucky bride, it is a gorgeous quilt. Just beautiful! I’m sure the recipient will treasure it. Now I need to go buy some of that strawberry fabric. Yummmm! 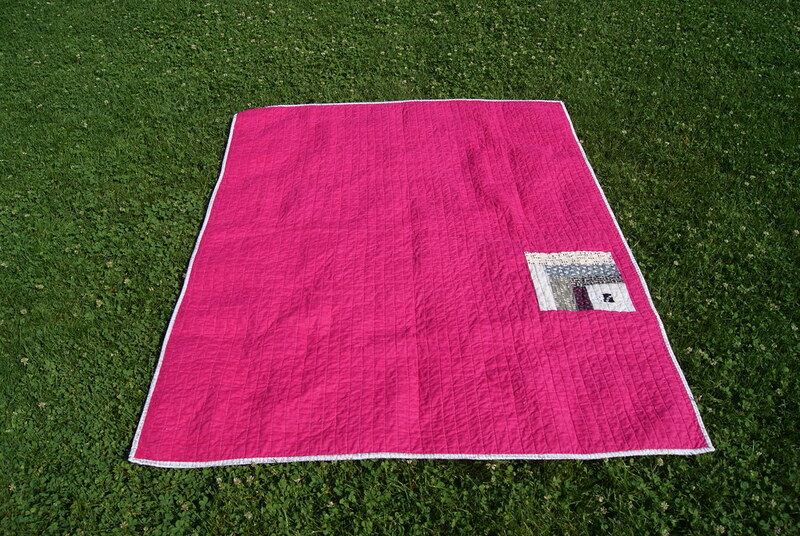 Such a cute quilt! 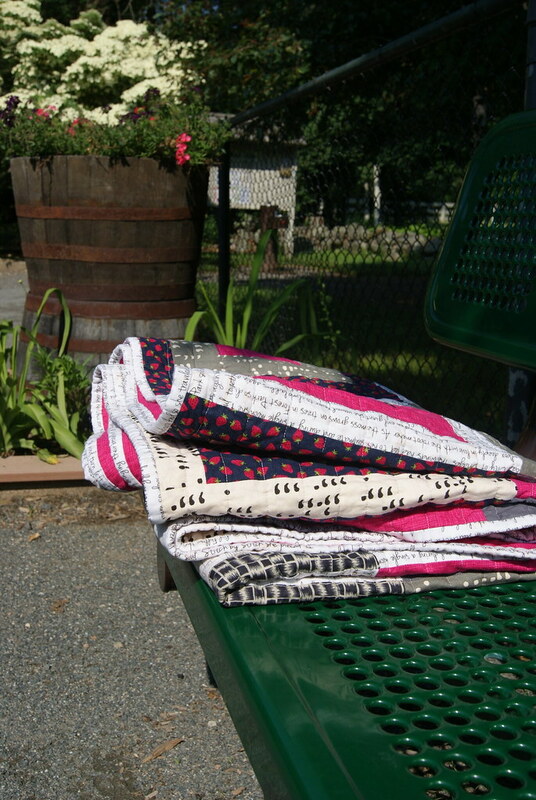 Very clever placing of the fabrics… the black pearl bracelets and lipstick pink really draw the eye across the quilt. I had to stop myself from buying any of that sketch the other day. I really don’t need it, but I do want it and not just in the pink that’s the problem!! Hmm… that is a really great pink. Hmm… are you sure we shouldn’t hoard it?